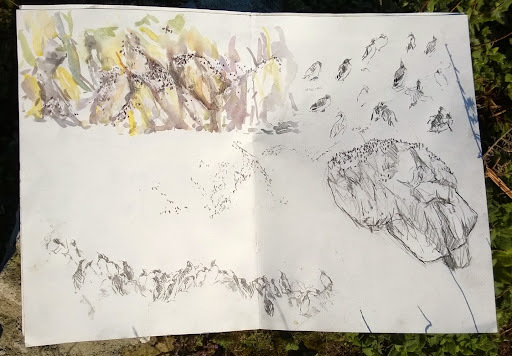 I arrived on Skomer Island today to start work on a new drawing project called Loomery Scrolls which will be exhibited at the Festival Of The Mind 2014 from 18 - 28 September. This arts festival is organised by the University of Sheffield each year to showcase the work it carries out by supporting collaborative projects between artists and members of the Universtiy. I am on the Island to meet Professor Tim Birkhead, Professor of behavioural Ecology at the University and a leading figure in avian biology. Tim has studied Skomer's guillemots at their breeding colonies or loomeries every year since 1972 and today for the first time, he is going to show me the sites that have occupied this research. A theme of festival of the mind this year is chaos, which could appropriately describe first impressions of the densely packed loomeries Tim studies; a single square metre of precipitous cliff ledge can be occupied by up to seventy nesting birds. However closer observation of individual behaviour reveals a strong social structure running throughout a loomery. Over the next five days and a subsequent week later in the season, it will be my job to make drawings that describe this order within the apparent chaos of the loomeries on Skomer. Thankfully Tim will be at hand to help me make sense of it all, along with his PHD student Elspeth Kenny and research assistant Julie Riordan who are also on the island. Happily for me; Elspeth is studying the colonies from a detailed perspective, focusing on the allopreening behaviour that strengthens the bond between breeding pairs and their immediate neighbours, whilst Julie presents a wider picture of the colony by carrying out the work of monitoring populations and ringed birds that has continued uninterrupted on Skomer for forty years. 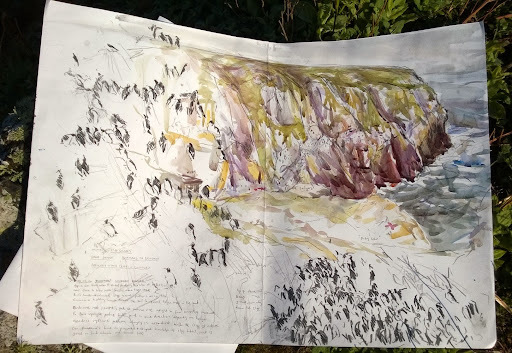 My approach will be to draw the loomeries bird by bird on long rolls of paper large enough to capture a sense of of the overall scene with enough detail to describe the posture and therefore behaviour of each individual guillemot within it (similar to work posted here on 26 May 2013). The overall aim being to exhibit drawing scrolls that capture the awe and wonder of Skomer's vast, seemingly chaotic loomeries whilst simultaneously describing the detailed and complex social order at the heart of their cohesion. Tim meets me in the morning and introduces me to his two main study sites. First the Amos; a folding elbow of volcanic rock, curving out to sea and back on itself to cradle a steep sided basin around which the colony groups form on mainly deep flat ledges. The densest groups of guillemots here are all on one level, perfect for the kind of linear composition suited to the scroll format I am looking to make. This is Tim's main study site, where most of his colour ringed birds are; individually identifiable with a numbered ring that correlates to a database giving the life history of birds in some cases over more than twenty years. I hope these stories will play a part in my work, which I hope to engage viewers in through a strong sense of narrative. To continue the population monitoring this year, Tim's field assistant Julie watches the colony throughout daylight hours from a small wooden hide using a telescope. She plots positions and codes I am yet to fully understand, on a large photograph of the site pinned to the hide wall. Next door Elspeth, has a yet smaller hide from where she collects her data on allopreening behaviour in the common guillemot. I fold myself into the hide and try it out for size, It would be cramped to draw in but could well be essential given the unsettling forecast for this week. The Amos is on the Western side of the Island facing South, exposed to the prevailing wind, which is strong today. Tim takes me to a more sheltered study site, the largest colony on the island, Bull Hole. When Tim first started studying this site for his PHD, there were approximately 500 birds in three groups he labelled a,b and c, shown on the drawing below. That was in the 70's, in 1966 there were around 5000 birds and the colony today is again close to that number. Skomer is one of the few seabird stations where guillemot populations have increased, making the research carried out here all the more important for tackling the declining population trend elsewhere, particularly the North Sea. Tim explains that since he started studying the Bull Hole site, guano and the treading action of the guillemots has broken down the grass and soil to once more reveal the bare rock ledges they need. Remarkably, this has occurred in such a way that the present day loomery is the same pattern and shape as that shown in photos from 1966. I have am interested in the way the pattern of a loomery is defined by the geology of the rock it is on; two forces of nature on different time scales causing an affect. At Bull Hole, I am finding two things visually striking, which makes the loomery unique to anything I have seen before. Firstly the ledges are very steep which means the loomery looks like it has formed in cascades flowing down the cliff face, narrow and dense in gullies, broadening out over spreading heaps of scree. The second difference is that I am seeing a loomery before egg laying has occurred for the first time. This means the birds, rather than incubating, seated and more stationary are standing upright with large groups facing the same directions determined by the angle of the ledge they are on, creating an overall monochrome patterned effect across the dark cliff face. Over the rest of the day I get to understand the structure of cliff and colony at Bull Hole, shown in the drawings below. 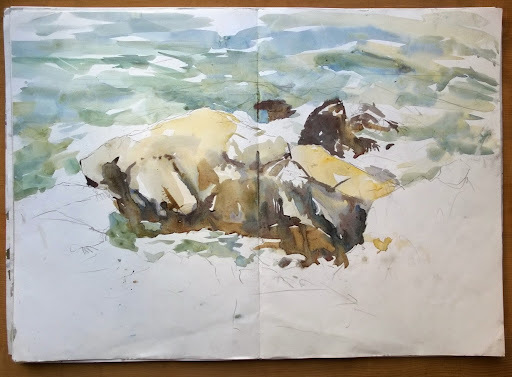 I focus on the nearest third and also densest area of the colony, drawing patterns, postures, formations of both groups and rock and finally compositions for the next days' drawing. Bull Hole, landscape, guillemot groups and patterns.